1942 is a year in Reg's life where detailed information is quite difficult to find. The following has been pieced together from his service record and personal letters. Reg is transferred to 240 Squadron. In March 1942, the squadron had left for India and spent the rest of the war flying anti-submarine and anti-shipping patrols over the Bay of Bengal. It would appear that Reg planned to join the squadron in India. He set off for India, piloting a flying boat (probably a Catalina). Unfortunately? he crashed badly on landing en-route in Malta. As you can see by the above address a slight error has crept in. In fact I shall be here for about a month or six weeks before carrying on. On 4 August he was declared unfit to fly, with a review recommended after 8 months. He was to be sent home as soon as possible. There are no records of his injuries but on the 4 August he was given 6 weeks sick leave. An entry of 'Operational Stress (Flying)' appears in his Medical Board records. However, it would appear that the situation in Malta in 1942 meant that injury (or stress) was no excuse. Enemy raids on Malta, particularly at periods when Axis convoy were being sent across with supplies for the Africa Korps, were extremely heavy, by April 7th 1942, the islands had 2,000 alerts and, by October 4th 1942, this number was raised to 3,000 through as much as 2,000 tons of bombs were dropped during a single month. Reg's skills as a specialist navigator were discovered and it was decided that he 'could not be spared'. He was appointed Chief Navigation Officer at AHQ Malta. 15 . 8 . 42 . Once again the whole picture has changed. As no doubt you gathered from my last cable there was a very strong possibility of my returning to England almost at once, but that I am afraid is out now. I had better start right now from the beginning and tell you the whole wretched story. When I arrived here I crashed and broke the boat pretty badly. Fortunately no one was injured but I was pretty badly shaken up. I was sent into hospital for observation and finally they decided that I must come off flying for eight months and then be re-examined. It was then decided to send me home as soon as possible. Then things began to happen, they discovered that I was a specialist "N" and said I could not be spared as Malta badly needed one. And so here I am and likely to be here for some time, Chief Navigation Officer at Headquarters. The only good thing about it is that it is nearer England than India. Incidentally I have now been promoted to the exalted rank of Squadron Leader. There is no record of the promotion in his service record, perhaps because the appointment was not to last very long. Once again the whole picture has changed completely and I am being sent home. The medical people here have decided that the only thing to do is to get me back to England. I don't know when I shall arrive, but it may take as long as a month or even a little longer. Still I shall roll up as usual like a bad penny. You must be pretty dazed about all these changes of plans, but this is the last one definitely. The medico's have made up their minds and once they do that nothing can stop 'em. Don't worry about me, physically I am perfectly fit, it is just that I am completely worn out mentally. As soon as I get back to England I shall be medically examined, almost certainly given a long sick leave and then given a ground job. The specialist here says that if everything goes well I shall probably be fit to fly again in about nine months or a years time. Reggie was transferred to personnel list on 2 September 1942 at No 1 Depot UK pending repatriation. 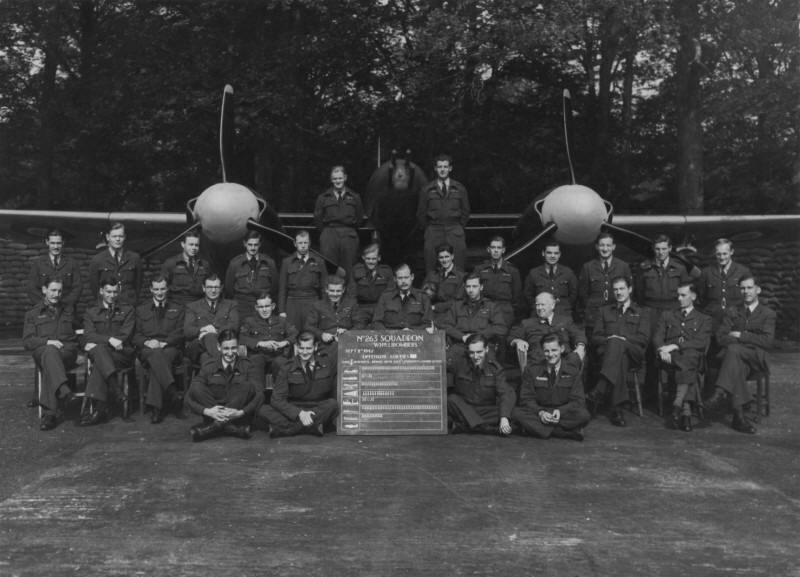 This photograph is a bit of a mystery in that Reg is seated (centre) in a picture with 263 Squadron, when his service record shows that he did not join this squadron until 1943. The board in the picture is dated 8 September 1942. In the latter part of 1942 the Whirlwind was adapted as a bomber and subsequently joined the Hurribomber in attacking the enemy in occupied territory with cannon and bombs by both day and night. One 250 or 500 lb. bomb was carried beneath each wing, and thus modified the Whirlwinds were unofficially known as "Whirlibombers". The fitting of bomb racks to the Whirlwind was advocated in September, 1941, by Squadron Leader T. Pugh, D.F.C., the C.O. of No. 263 Squadron, but it was not until 21st July, 1942, that the first of the squadron's Whirlwinds was modified to carry bombs. The first "Whirlibomber" operation-by No. 263 Squadron and only intended as a trial run-took place on 9th September, 1942, when two sections, escorted by Spitfires, attacked four armed trawlers steaming from Cap de la Hague, near Cherbourg, towards Alderney. Reg had somehow found his way back to the UK much quicker than expected. Despite his illness, did he take part in this operation in a non-flying navigational role? Reg is posted to HQ No 9 Group in a navigation role. No. 9 Group covered north-west England and Northern Ireland. Reg and Norma`s daughter Helen Ann was born in Doncaster, South Yorkshire. 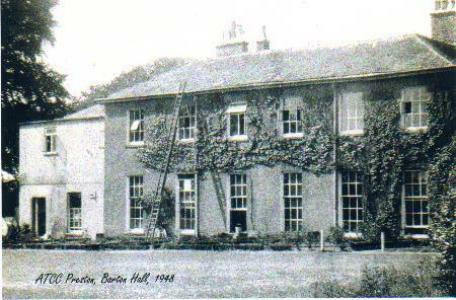 Reg is in Barton Hall, Nr Preston 'ill with a hefty bout of malaria'. His medical classification of 'A4BT' which precluded him from flying was changed to 'A1BT - fit to fly'. After nearly 5 months 'grounded', the nature of Reg's operational flying was now to change markedly.